This is a guest post from Connie, she is a freelance writer, editor, and content manager. She works in the eCommerce industry and is passionate about all things digital. She is also the founder of Savvy With Saving, a personal finance blog for millennials. You can connect with Connie on Twitter @SavvyWSaving. Let me know if you would like to guest post on RFI. The American Dream is centered around owning your own home. In fact, a house has become a status symbol of sorts. But it doesn’t always mean you’ve made it. Especially in times of economic downturn, we’ve heard countless stories of people’s homes going into foreclosure. Is being a homeowner really all that’s it cracked up to be? Yes and no. Buying a home can be a very profitable investment. And it also symbolizes a long term future for you and your family. But it’s not always the wisest financial decision. While throwing money away on rent can be a tough pill to swallow, it may be the smarter choice. 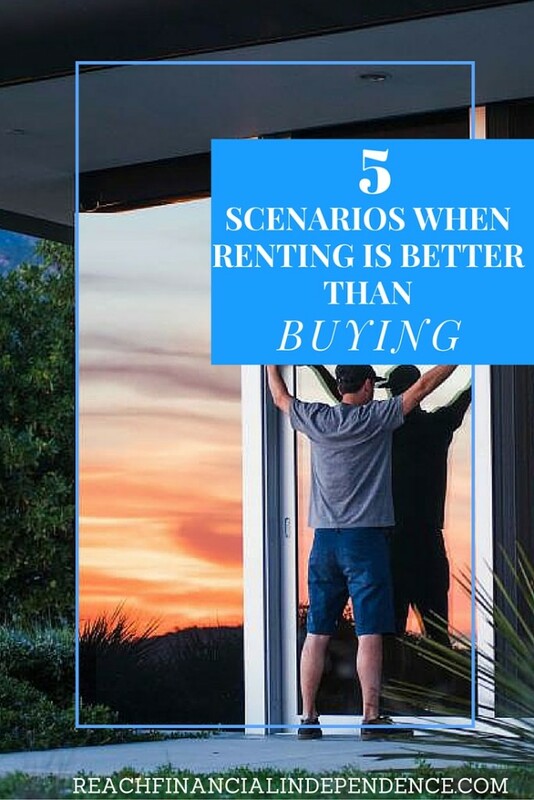 Let’s take a look at 5 scenarios when buying is better than renting. Buying a home is a long term commitment. So ask yourself this – how long do you see yourself living there? If it’s only for a few years, you may want to re-think whether homeownership is the best decision for you right now. Owning a home is by no means a permanent decision. But with all the added costs, such as repairs, maintenance, and closing costs, you want to make sure you’re getting the most of your money. Be sure to do the math. It’s hard to say what ‘enough’ is for a down payment. It can be dependent on your mortgage rate and your financial status. But if you’re planning on putting down less than 20%, you should carefully rethink it. While buying may seem like a financially smart move, you’re going to be paying a considerable amount of interest if you’re not putting a lot down, especially in the first few years. Buying property can be cheaper than renting and also a great investment but it boils down to location, location, location. For instance, the cost of real estate in New York City is considerably higher than the national average. While property values historically appreciate in certain areas, it can take a considerable amount of time for you to break even on your investment. That isn’t necessarily time you have, especially if you need to move within 5 years. And on the flip side, the market could tank. A mortgage isn’t the only expense when it comes to home ownership. There are lots of ‘hidden costs’ that many prospective buyers forget to think about. For starters, think about general maintenance and upkeep of your home. You’ll be responsible for all repairs. Also, if you want to sell your home in the future, you’ll encounter closing costs, which can be as much as 4% of the total selling price. Factor in other miscellaneous costs like utilities and insurance and home ownership starts looking quite expensive. While owning a home yourself can feel very rewarding, it can also be very stressful. Aside from the day-to-day costs running of your home, you have a mortgage to think about. And in times of financial hardship, a mortgage payment can be a dark cloud looming over your head. Think carefully about the financial implications of purchasing property and whether or not you can truly afford it now and in the long run. Making the decision to rent or buy isn’t as cut and dry as you may think. While buying may seem like the obvious choice from an investment perspective, it doesn’t always save you money. Especially if you crave flexibility, renting may be the wiser choice in the short-term. Deciding whether to buy or rent is a personal decision so do all your research and calculations. All these are great points – although shouldn’t the title be 5 Scenarios When Renting is Better Than Buying? I think I’m a lifetime renter – I’m too much of a nomad. Great points! You don’t want to be house poor! There is nothing wrong with renting if you have a plan especially if you know that getting a home at the moment isn’t right for you. Just because everyone else is buying doesnt mean you have or need to. The time that we bought a house was when we decided that we no longer wanted to pay the hidden costs and to deal with worry and stress. It was really a good time to buy a house back then. Buying a house is the best option there is. People that are renting a house are just forced to rent because of some other reasons like they cannot acquire a house at the big city already or there’s no choice because they need to live near the office. But if ask everyone, they would definitely answer that they want their own house. Not always true. We own a home right now and are about to put it on the market in favor of leasing a home instead. Our home value has increased 70% and we want to pull out our equity and sit on it for a bit until we decide our next steps. It may turn out that we like leasing vs. owning – flexibility is a major driver for us right now. As we look to sell our home we’ve found that closing costs are closer to 8% with the 6% in commissions for our real estate agents and other miscellaneous costs (not even including getting the house prepped to sell). We won’t buy again until we know for sure that we plan to stay a long time because 8% of a house’s value is a tough pill to swallow. We lucked out buying when the market was down and we’re selling at a decent profit but we could just as easily have been in the reverse situation. Appreciable”” “5 SCENARIOS WHEN BUYING IS BETTER THAN RENTING” Purchasing a house is the best choice there is. Individuals that are leasing a house are simply compelled to lease in view of some different reasons like they can’t obtain a house at the enormous city as of now or there’s no decision since they have to live close to the workplace. Yet, in the event that ask everybody, they would answer that they need their own particular house. The most important housing decision that most consumers face is whether to rent or to buy. I think buying a house is really effective as is keeps with you as long as you want .